Dried sausage - amazing taste of the product. Need to buy it in the store, you can cook dried sausages on their own, at home. So it turned out delicious, it must be properly dried. - 150 g thin pork intestines. First of all, you should do the cooking meat. Pork neck cut into small pieces and passed through a large grill meat grinder. However, much tastier get dried sausage, if boneless pork chop with a knife. The size of the pieces should not exceed one centimeter. In this case, first the pork cut into long and thin strips, and then cut with the large knife across the grain. Especially tasty sausage, if you replace the fourth part of the meat with slices of fresh bacon. Add minced salt, pre-chopped garlic, marjoram and black pepper to taste. Carefully vymeshat beef, leave it alone for about 5 hours so the meat can better absorb the salt and spices. A container of ground beef, be sure to cover the lid so the meat does not zavetrilos. Periodically it stirred, achieving a uniform distribution of spices and salt. After a time in the stuffing, pour the right amount of alcohol, mixed again and begin stuffing the intestines. 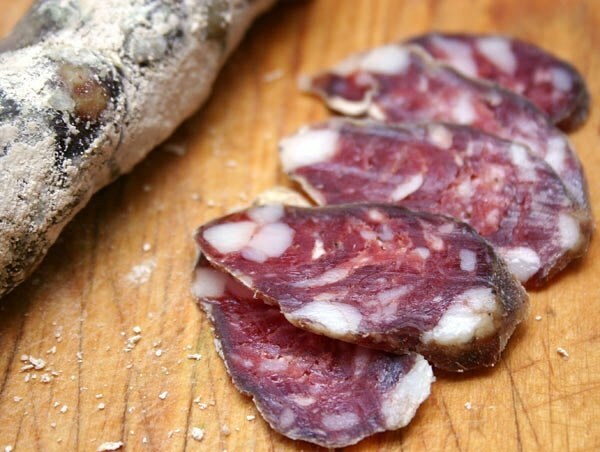 If you replace the alcohol with brandy, finished dried sausage will acquire a pleasant taste and color. To cook the sausage, remove with grinder bars, and to put in its place nozzle made in the form of a tube. The gut washed with tap water and gently squeezed. To make it easier to fill the colon with minced meat, cut it into approximately equal parts with a length of 50 cm. One of these parts put on the nozzle, tightly bandaging the other end of the thread. Beef mince, as the filling by pinching the intestine. Do not hurry up, the gut may burst, so you need to monitor the uniformity of filling. After the formation of sausage, the second end of the intestine also tie with thread. The need to pierce sausages in several places and to release them from the air. Bandages moistened in a salt solution prepared from the calculation: 3 teaspoons of salt in a glass of water. Then, the bandages tightly enough wrapped around the sausage and hung in the place meant for drying. It is important to prepare the place where there are no drafts. However, during a drying room in which hangs the sausage should be well ventilated. The optimum temperature of +10-15°. In addition, the room should be bright. After 2-3 days remove the sausage and lightly roll with a rolling pin, giving a flattened appearance. Also with the sausages removed the bandages again and hung for further drying. Dried sausage should valitse not less than 2 weeks. After that, you need to try it on the cut. If the product is not provalilsya in the middle, it is sent to the bottom compartment of the fridge used for storing meat, setting temperature +2 ° C. To devalvatsia in the fridge, the sausages will be another week. After that you can bring to the table.